In March of 1982, Jeffrey Phillip Wielandt was a heavy metal-obsessed, 15-year-old living in Jackson, New Jersey. He was just starting to get serious about the guitar, and he loved the music of Ozzy Osbourne - he even had tickets to see Osbourne play at Madison Square Garden. The show was scheduled for 5 April. Wielandt is now better known as Zakk Wylde, and he remembers sitting at the kitchen table with his parents a couple of weeks before the concert. "My mother was looking at the paper, and she said, 'Oh, this boy from Ozzy Osbourne's band was killed in a plane crash. You really like him, don't you?' I couldn't believe it. It was unbelievable." In 1987, Wylde joined Osbourne's band, replacing Jake E Lee, whose tenure as Rhoad's replacement lasted only five years. Wylde would go on to become Osbourne's longest-serving guitarist, (he parted ways with the singer in 2009), performing the music of Randy Rhoads on countless stages across the globe. As the 30th anniversary of Rhoads' death approaches, we spoke with Zakk Wylde to talk about the impact the late guitarist had on him - and how it felt to step into his hero's spotlight. Is it hard to believe that it's been 30 years since Randy died? "It is hard to believe. But you know, the testimony to Randy's greatness is the fact that we all still remember. Whenever my buddies and I get together, we can't help but talk about Randy Rhoads. "Let's say he didn't have to go up to God's tavern when the good Lord needed him. Let's say he just walked away from it all and went back to teaching, which he was thinking of doing - he wasn't all that comfortable with the fame thing and playing big places - he'd still be a total legend for what he did on those first two Ozzy records. "What he achieved in just a couple of years is right up there with the best of the best. He did on two albums what most guys can't do on 20. That's pretty remarkable." Before you had a chance to audition for Ozzy, you were studying Randy's playing. "Oh, totally. Without a doubt, I studied him. He had unbelievable technique and could do all the things on the guitar that are astounding. His scales, the diminished scales he used - unreal. But it was his writing and the way he composed his solos - I mean, his solos were songs within the songs… He was way ahead of what everybody else was doing." 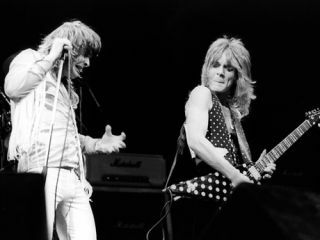 "I learned all of Randy's solos - before I even got in Ozzy's band. But when I was in the band, I absolutely played them Randy's way. You have to. There's no reason not to. I mean, it's not like you could fill his shoes - that's impossible - but you have to give respect to his music. There is no other way. Whether it was me or Jake E Lee or Gus G or anybody, you've got to play Randy's solos like Randy did. "To me, each and every one of his solos are like gold, man. They're like Stairway To Heaven or Hotel California - you're waiting for those incredible moments, and when you hear them live, they have to be like on the records." Take us back to how you came to audition for Ozzy. "My wife - she was my girlfriend then - Barbaranne, she heard on Howard Stern that Ozzy was looking for a guitar player. Right at the same time, I was in a club and this guy, Dave Feld, said the same thing, and he was friends with Mark Weiss, the big photographer who had just done some shots of Ozzy. "So I made up a tape and gave it to Dave, and then he gave it to Mark, who got it to Ozzy. I got the phone call to do the audition, and I couldn't believe it. "I didn't think I had it in the bag or anything. My attitude was, Hey, I'm meeting Ozzy - that's good enough for me. I remember there were all these other dudes at the audition, and they were all older than me and they were saying stuff like, 'Yeah, I hear it's a good-paying gig' - stuff like that. They couldn't give a crap about Ozzy's history or Randy or any of that. They were just into the fame and the money." What songs did you play at the audition? "I think we did Bark At The Moon, Suicide Solution, Crazy Train and I Don't Know. I played Randy's stuff accurately - Jake's too. It was an intense thing, but I tried to not let the nervous energy get to me. You can't let anything bother you in a situation like that. If you do that, you'll fail. I remember I just wanted to do well - that was it." At any of your first shows with Ozzy, did you experience negativity from Randy loyalists? "No. Not at all. Everybody was great. The people were on my side because they knew I was one of the guys. I was on the team, you know? They knew I loved Randy as much as them. Everybody was rooting for me." In playing Randy's music live, how do you feel it changed you as a guitarist? "I think any guitarist who's inspired by or influenced by Randy knows what a brilliant soloist he was. I really got my head around where you could go with a solo by playing Randy's music. Construction - playing a beginning, middle and end - that's one of the biggest things I got from him. "There are other things - scales, diminished scales, hammer-ons and pull-offs - that were all part of Randy's arsenal. But the melodic sense of the solos, how you can tell a whole new story in a song, that's his crowning achievement. "Randy had what only the greats have - he had feel. Great musicians, you don't just hear them, you feel them. When I listen to Randy Rhoads, I feel every note. I learned a lot from him."